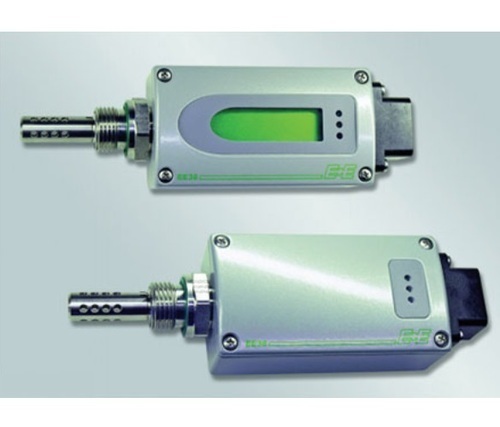 E+E Transmitter Series EE381 are specially designed for the measurement of water content in oil. EE381 is ideal for online monitoring of moisture in lubrication or insulation oil, which is very important for the long-term performance and preventive maintenance of plant and machinery. For instance, moisture affects dramatically the insulation characteristics of electrical transformer oil and therefore continuous monitoring is extremely important. Humidity measurement in oil: Similar to the humidity in the air, the water content in oil can be indicated by the absolute value in ppm or by the relative value aw: - ppm (mass of water/mass of oil) - aw (actual water content as fraction of the water content in saturated oil) aw = 0 corresponds to water-free oil, while aw = 1 indicates saturated oil. aw, measurement with the EE381 transmitter is based on the outstanding long-term stability and resistance to pollution of the E+E capacitive sensor elements series HC. The measured physical quantities are water activity aw and temperature T. With these quantities EE381 calculates the water content x (ppm) in mineral transformer oils. Calculation of water content (ppm) in non-mineral oils and lubrication oils can be achieved by programming the specific parameters of the oil into the EE381. Software: The optional configuration software allows flexible and easy adjustment of the analog resp. relay outputs to the respective requirements. The adjustment/calibration of the transmitters can easily be performed. Screw Connection for Mounting: - 360° positionable The construction of this screw connection enables any position/rotation of the mounted transmitter. So an optimal position of the display resp. The cable outlet is guaranteed. Established in the market in 2009, we "ACT Sensors Private Limited" indulged in manufacturing, trading of quality range of Data Logger, Pressure Transmitter, Level Sensor, Dew Point Transmitter and Digital Pressure Gauge. By using high-quality raw material and manufactured using the latest technology by qualified professionals we are always meet the customer requirement on time and all our products are of international quality standards. Entire collections of raw materials are purchased our reputed vendors based on their reliability, quality, and the ultra-modern techniques.